This page offers short success stories and/or quotes from Oklahomans who have received free durable medical equipment from the Oklahoma Durable Medical Equipment Reuse Program (OKDMERP). If you're interested in more information regarding the devices available, just click the "plus" sign in the boxed area below! You can also reach us at 833.431.9706 (toll-free and v/tty) or 405.523.4810. Apply for equipment here. Showering with a shower bench or tub transfer bench can make showering so much more relaxing and safe. The whole point of using a shower bench is safety. If you have balance or mobility problems, then sitting down to shower is much safer than standing in a wet tub. If you have vision or pain issues, then being seated is much safer than being on your feet in a shower or tub. The shower bench or tub transfer bench can accommodate a user who has difficulty lifting legs to get in and out of the tub in a stable, balanced position. As a caregiver or a bather, your experience in the shower can be much safer, and therefore, much more enjoyable. A tub transfer bench which has adjustable non-skid legs so you can get a stable and height according to lay out of your bathroom. Once adjusted, make sure all snap adjusters are firm and secure. The legs of the bench are made of lightweight aluminum so the bench is lightweight and will not rust. Handles on the bench are helpful in handling the bench itself and in grabbing it when sitting down or rising. Digital monitors are more popular for measuring blood pressure. They often are easier to use than aneroid units. The digital monitor has a gauge and stethoscope in one unit. It also has an error indicator. The blood pressure reading displays on a small screen. This may be easier to read than a dial. The strongest desire of any person in loss of autonomy is to be able to fend for himself despite his limitations, especially when it comes to intimacy and personal hygiene. A commode chair allows you to avoid moving up to the bathroom and so go to the toilet without help. Some people with reduced mobility avoid waking up their caregivers at night to ask for assistance and prefer to wait for them to wake up. A chair of autonomy that sits next to the bed makes it possible to relieve oneself autonomously, in all modesty and discretion. Few limited people in their movements easily accept the idea of being helped to go to the toilet even if the caregiver is a very intimate person of their Entourage. A commode chair offers a person with reduced mobility more privacy and commode as this equipment allows him to count on herself or himself throughout the day for his or her personal biological needs, thus preserving his dignity. In addition, some models of adjustable height chairs are installed directly over the toilet, which avoids the installation of a fixed toilet booster, less discreet for the visit. It is clear that the risk of falls and serious injuries in people with loss of autonomy or mobility is more important. Thanks to the support bars, the commode chair allows you to limit risky maneuvers when the time comes to assist a person who lacks strength or balance to get up alone. The work of the caregiver also becomes more secure. A commode chair helps to reduce the risk of injury by minimizing travel, especially at night between the bed and the toilet. CPAP can prevent or reverse serious consequences of obstructive sleep apnea. The treatment can help protect you from these serious health risks such as heart disease, stroke, diabetes, and even help prevent motor vehicle accidents. Using a CPAP to treat your sleep apnea can improve your life and make each day better. It can help improve daytime alertness, concentration, emotional stability, help stop snoring and reduce medical expenses. Sleep apnea can lead to more health problems and more doctors' visits. When people start CPAP therapy they are usually concerned with daytime sleepiness, concentration, depression, weight gain, links to diabetes type II, heart disease, hypertension, and numerous other negative impacts to the body and mind that result from a lack of deep restful sleep. Like any change to a regiment, adjusting to sleep therapy or the use of a CPAP machine requires some adjustment. However, keeping the goal of a better quality of life in mind, after a few days, weeks or months (depending on how long they have gone without therapy and a good night of sleep) most users start to see very positive and life changing CPAP benefits! Gait training refers to helping a patient relearn to walk safely and efficiently. Rehabilitation specialists who evaluate the abnormalities in the person’s gait and employ such treatments as strengthening usually do gait training and balance training to improve stability and body perception as these pertain to the patient's environment. The desired result is for the patient to have the ability to ambulate safely in all environments with the least amount of assistive technology possible with the end goal of gaining a level of independence they did not previously have. The physical benefits include a decrease in likeliness of developing osteoporosis. Weight bearing patients have shown increase bone mineral density in the femur as well as the spine. Static movement has shown to be more beneficial than dynamic loading. It improves overall alignment, prevents contractures, and decreases spasticity. It can also provide improvement of internal organ function including the circulatory system, lungs, bladder, and bowels. A home care hospital bed is a great alternative for patients who need the functionality of a hospital bed without the need to remain in the hospital. It can help reduce medical expenses, aid in the healing process, and reduce the amount of time spent in the hospital. A semi electric home care hospital bed has all the same functions as a manual bed except semi electric beds have a motor for the head and foot positions to move up and down. This bed has a remote with four buttons that will raise and lower the head and foot section. The manual hand crank at the foot of the bed is used to raise and lower the height of the bed. The hand control gives the user the ability to move either section with the press of a button. If moving the bed deck height is necessary for the patient to do while they are still laying down, then the best solution is a full electric bed. A knee walker can be a welcome alternative to crutches for people who are recovering from knee, foot, ankle, or lower-leg injuries and surgeries. Also called leg walkers or knee cruisers, these mobility aids are designed to enhance independence, while allowing injuries to heal. The most common advice medical professionals offer after a broken foot, ankle sprain or knee injury is to keep the injured area elevated, and get as much rest as possible. For many of us, staying of our feet just isn’t an option: there are household tasks to perform, routine duties at the workplace and other daily chores that require us to stay mobile. During the weeks of recovery after surgery, knee scooters not only provide physical help, but mental as well. Knowing that you are not house bound and are able to resume your daily life has a great effect on speeding up your recovery. Nebulizers deliver liquid or aerosol medications that help you breathe to your lungs via a mask or mouthpiece. Medications given via nebulizer can treat acute conditions or can prevent respiratory problems from developing. Nebulizers have benefits as a treatment for lung disease over oral medications or inhalers. Nebulizers send medications where they are needed most -- your lungs. Unlike systemic medications, which take time to pass through the gastrointestinal tract to your bloodstream, nebulizers deliver medications very quickly directly to the respiratory tract. Albuterol, a commonly used bronchodilator, begins to work in around five minutes when given in nebulizer form, compared to around 30 minutes when given orally, the American Association for Respiratory Care reports. Nebulizers require very little effort to use. Unlike inhalers, which generally require you to breathe in when you release the medication, the medication in a nebulizer treatment flows continuously. You breathe normally during the treatment. Newer nebulizers are small enough to be portable, although not quite as portable as inhalers, which fit easily into a pocket. Powered by battery or electricity, nebulizers take between 5 and 10 minutes to deliver a full dose of medication. Even babies or severely debilitated people can receive medication by nebulizer. Why should you bother to invest in patient lifts? One word: Safety. Safety for patients who lack the strength and mobility to move without the anxiety of imminent danger or fear of injury. Safety for your staff in order to assist patients as efficiently and compassionately as possible to provide the services and treatments they require. When a patient is unable to safely move on his or her own, why place a member of your staff in a potentially highly injurious situation as they attempt to aid the patient? All too often, this scenario takes a tragic turn when the caregiver, patient, or both suffer lasting injuries resulting from a truly preventable accident. A patient can be safely, efficiently, and most important, compassionately transported to where they need to go by using a patient lift. A quad cane is a mobility device that aids walking and mobility. It is similar to a standard cane, but it has a metal base on the bottom with four small feet that extend from the base. These feet have rubber caps that help reduce slippage on the floor. Quad canes are usually made of lightweight aluminum and are adjustable with a small push button. An extended period of immobilization or bed rest may lead to changes in your balance. A quad cane helps provide extra support to allow you to walk independently and safely. An advantage of a quad cane is that it provides good stability. Quad canes can also be used on stairs, unlike a standard or wheeled walker. Occasionally after illness or injury, one or both of your legs may be weak. This weakness may prevent you from walking normally. An extended period of immobilization or bed rest may lead to changes in your balance. A quad cane helps provide extra support to allow you to walk independently and safely. Rollators are easier to use than walkers because they are simply pushed like a cart rather than having to be lifted. Rollators are perfect for use outdoors where the surfaces may be uneven. Often misconceived as an indoor mobility aid, rollators are, in fact, very practical for outdoor use. As they are light and foldable, they can easily be placed in the boot of a car or other form of transport. Some models can also be used on rougher terrains, which should appeal to adventurous types. Most people considering rollators do not contemplate that they can be used to sit on for both comfort and stability. They are useful in public venues, such as shopping centers, allowing the user to take a respite from shopping and rest their feet. One benefit all mobility scooters provide is comfort for users that have trouble walking or standing for long periods. Using a mobility scooter will help users get around and find easier ways of transporting themselves. The motorized mobility scooter offers active people with one of the easiest and more fun ways to spend a day outdoors. These nifty devices will allow anyone who struggles with mobility the opportunity to remain independent and active and to do a lot more while outdoors. Modern mobility scooters fit in brilliantly with the ever-changing ways in which people socialize. With shopping centers and public spaces constantly improving accessibility, it is becoming much, much easier for mobility scooter users to access these sorts of places. Another benefit is that portable mobility scooters can usually be taken on public transport. Whether you’re older or just don’t have the physical strength, falls that cause injury become a real risk. With the aid of a mobility scooter, chances of fall-related injuries are decreased significantly. There are several other reasons to why you or a loved one may need a mobility scooter, such as recovering from surgery. Owning a mobility scooter limits the physical exertion needed to move around. This freedom can allow for a much more comfortable healing process. Mobility scooters are ideal for those who tire easily. It is essentially an electric vehicle that allows you to get active without the use of an assistant or care giver. Increased independence is inevitable, but mobility scooters have more than physical benefits. Psychological benefits from being able to leave the house when it suits you, and peace of mind for both you and your loved ones, make owning a high-quality mobility scooter the perfect long-term investment. A shower chair is an additional bathroom furniture that is designed to help people with physical limitations and enable them to have shower properly. A shower chair is designed and functioned simply as a chair on which its users can have a seat during the shower. By sitting in a safe chair, it minimizes their risk of injury, painful movement as well as falling over the wet floor. This device is highly helpful and beneficial for physically limited persons, especially those with disabilities. Shower chair has basic design in common. A shower chair usually consists of several elements or parts. These elements or parts include the seat as the main part, the legs, the armrest, and backrest. Typical shower chair has two main features. First, a shower chair has well-textured seat surface to prevent users from slipping out the seat. Additionally, the seat is designed with wholes or cutouts to result quick drainage. In terms of particular design and customization, shower chair comes in various form, type, size, and additional features. However, still its main function and purpose is to be an assisting device for those with physical problems when bathing. In addition, its main agenda is to lessen the risk of injury. For those who are severely limited in their mobility due to a disorder, disease or injury could also be helped greatly by standing for an hour or two as part of their daily therapy. Standers give users the support they need to stand and allow their bones to bear their weight a little every day, managing density reduction and even strengthen them over time. Just as bone density drops with a lack of weight bearing, muscle strength in the trunk and legs degrade with inactivity, causing poor posture, neck and joint soreness, back pain and muscle fatigue. With the support of a stander or standing frame, an individual is allowed to work the muscles in both their core and lower extremities more effectively than they can while sitting. With daily activity, one can reduce and manage the rate of atrophy in those areas and elevate their overall comfort level. Bladder and kidney function also benefits thanks to gravity’s pull. Standing upright allows the bladder to empty itself more completely, lowering the risk of urinary tract infections. In addition, because the entire excretory system works better when vertical, the threat of kidney stones can also be reduced. Standing allows heart and lungs to get a workout of their very own. The lungs can fill more fully, blood can flow more freely and the heart has to pump a little harder against the pull of gravity to push blood up from the trunk and legs. The temporary pressure relief can also reduce the soreness and risk of pressure ulcers that comes with prolonged sitting. The legs help provide extra support while you are walking. There are also rubber caps on each leg to help grip the floor and prevent the walker from slipping. An advantage of using a standard walker is that it provides a great amount of stability to help prevent loss of balance and falls. A walker helps substitute for a decrease in strength, range of motion, joint stability, coordination, or endurance. It can also reduce the stress on a painful joint or limb. Using a walking aid can help you be more safe and independent in your daily activities. A walker is a type of mobility aid used to help people who are still able to walk (e.g. do not require a wheelchair) yet need assistance. A four-legged frame allows a person to lean on it for balance, support, and rest. Walkers are usually made out of aluminum so they are light enough to be picked up and moved easily. They often have comfort grips made of foam, gel, or rubber to enhance the user's comfort. The tips of the legs are typically covered with rubber caps that are designed to prevent slipping and improve stability. Manual wheelchairs have a number of advantages and many active people prefer to use a manual wheelchair as much as possible. Consider the advantages as well as your personal strength and energy levels as you will need plenty of both to operate a manual wheelchair. Manual wheelchairs come in a variety of weights and configurations, from standard to ultra-lightweight and even sport recreation wheelchairs. If you are going to be spending a lot of time in your wheelchair, opt for a lighter weight chair, as you will use less energy throughout the day to operate it. Manual wheelchairs do not need charging. Manual wheelchairs are cost-effective with little maintenance. Manual wheelchairs require little space. Manual wheelchairs are easily maneuverable and can be configured to meet your needs. Manual wheelchairs are easily transportable and are great for travel and easy storage. 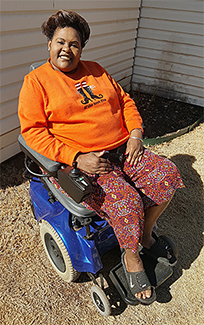 Power mobility allows people to move within their home and community and it can help maximize independence for those with limited mobility. Power wheelchairs allow a person to travel for long distances. This is an important benefit for people with limited mobility as it provides opportunity to go farther in their community than they might in a manual wheelchair. Power wheelchairs typically have a smaller turning radius, which means that they are more maneuverable in small spaces. Power wheelchairs also offer the benefit of traveling over a variety of terrain through the options of tire types and wheel positions. One benefit all power wheelchairs provide is comfort for users that have a hard time standing up or walking for long periods. Using a power chair will help users find an easier way of transporting themselves. A power wheelchair can enable you to do more with less pain, less fatigue and more mobility. The most obvious advantage to owning a power wheelchair is that they are easy and convenient. Although power wheelchairs do have an electric motor, they are still controlled by the individual in the chair. ”The reason I love my power wheelchair is because it helped me become independent again. I could not walk 10 ft. without it. OKDMERP is a big blessing to me because without it I would be bed-ridden. They are a Godsend and my guardian angels. They've given me at least four medical devices." C Corpus is a child that cannot walk nor use his bath without a chair. His dad picked up a shower chair and they say, "We are so blessed to get this equipment and we love the OKDMERP program." 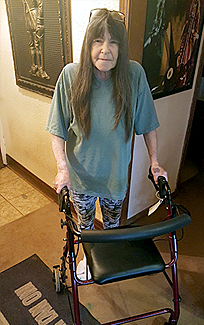 D Brown picked up a manual wheelchair for a friend of hers who is very frail and cannot walk without assistance. D says, "I have been getting equipment from OKDMERP going on 24 years – it has been helpful to me and others." D says she crushed a vertebrae and her doctor says she won't walk again. "I'm so thankful to find out about the reuse program. It will allow me to be mobile and to continue to do basic things for my family like cooking. You guys are a lifesaver!" ”I'm getting ready to have knee replacement surgery and this walker will be a lifesaver. Medicare will only pay for one device so having a walker is keeping me active." ”I have diabetes and high blood pressure. With this home-based blood pressure meter I can monitor my own pressure and avoid having to go to the doctor's office all the time to be checked." ”I have a spinal cord injury and my mother told me about the reuse program. With this cushion, I can sit so much more comfortably." 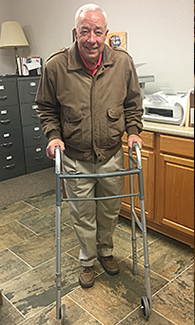 ”I have bad knees and this rollator will help me walk and feel confident. It will also allow me to sit down to rest during my walk." ”I have cerebral palsy and I've also fallen recently and broke my hip. I heard about the reuse program from my doctor and I'm very grateful for this walker. It will help keep me steady – thank you." Contact Oklahoma Durable Medical Equipment Reuse Program (OKDMERP) if you need medical equipment to help you with a disability. Call 405.523.4810 or 833.431.9706 (v/tty) for more information or "Apply for DME" on this website.